The Public Works Authority ‘Ashghal’ has started the construction of the first Cable-Stayed Bridge in Qatar and the conversion of Haloul Roundabout into a two-level interchange on Sabah Al-Ahmad Corridor project. The 1,200-meter long new bridge extends prior to Haloul Roundabout through Faleh Bin Nasser intersection in Salwa Road to provide free traffic flow between Hamad International Airport and the areas of Bu Hamour, Mesaimeer and Al Waab. 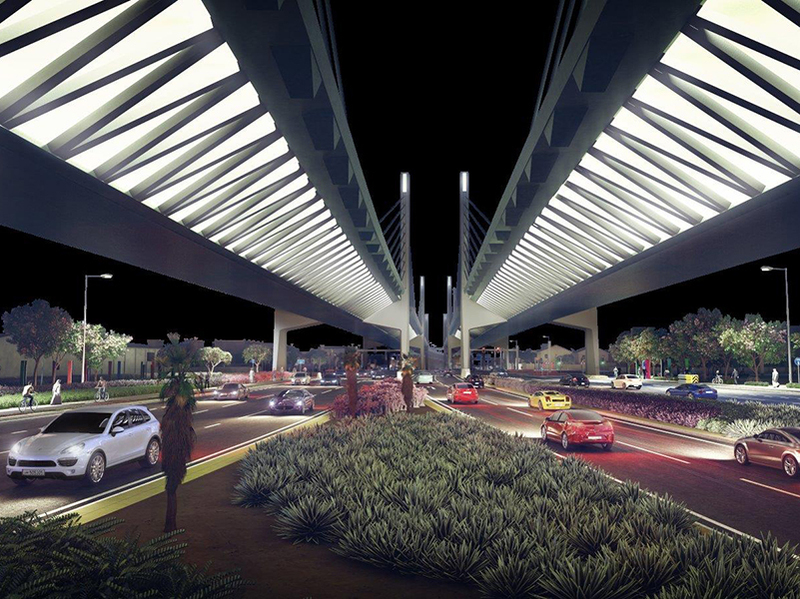 The new bridge will consist of four lanes in each direction to accommodate more than 16,000 vehicles per hour. Due to the length of the bridge, construction work will require the use of 854 precast concrete pieces, each weighing about 200 tons of reinforced concrete and 20 pylons and 16 piers to reach the highest point of the bridge to 30 metres high. 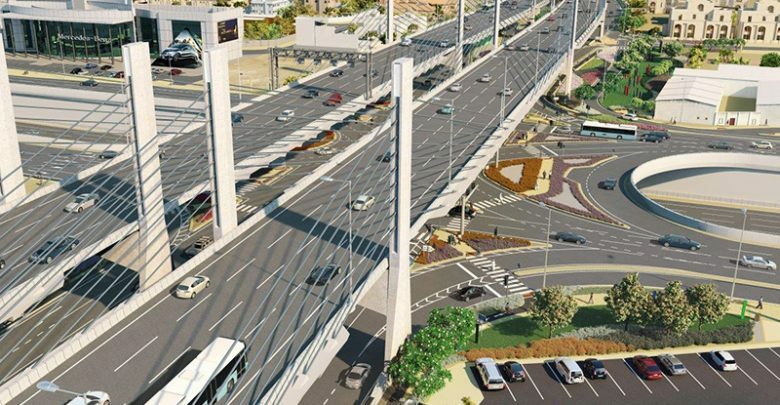 Halul Roundabout will be revamped into a two-level interchange, which will include at-grade signalized intersection along with the free flow Cable-Stayed Bridge. With the completion, the signalized intersection will consist of (6) lanes in each direction, including two right turns to the left and one for U-turn. 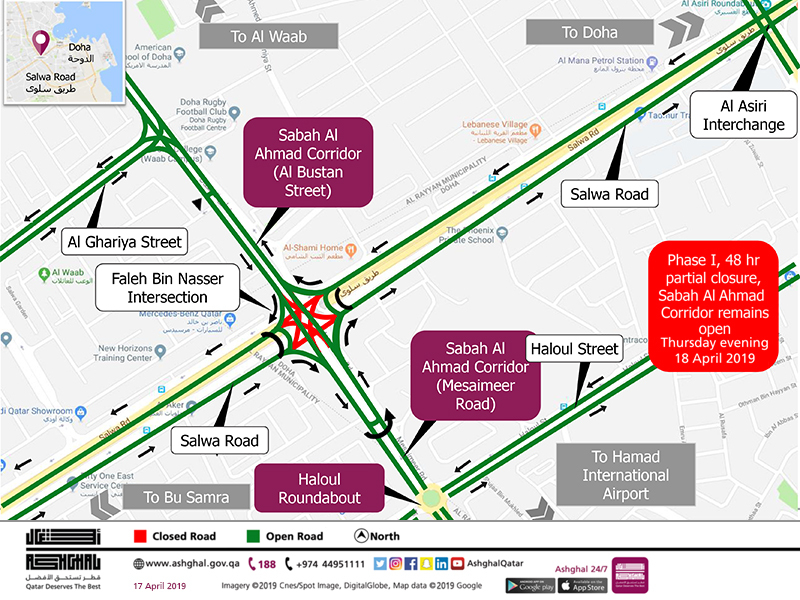 The intersection will help the traffic in all directions to connect Sabah Al Ahmad Corridor to Halul Street and Salwa Road. It will serve Bu hamour and Al Mamoora and many vital facilities surrounding the Wholesale Market and commercial activities on Salwa Road. Engineer Abdullah Al Naiemi said that Ashghal has already started construction of the first Cable-Stayed bridge in Qatar, which was designed in a unique way to provide a free traffic flow without the need to pass through roundabouts or light signals, especially that the bridge will pass over Halul intersection as well as Faleh Bin Nasser intersection on Salwa Road, which will ease the congestion in the vital area significantly. 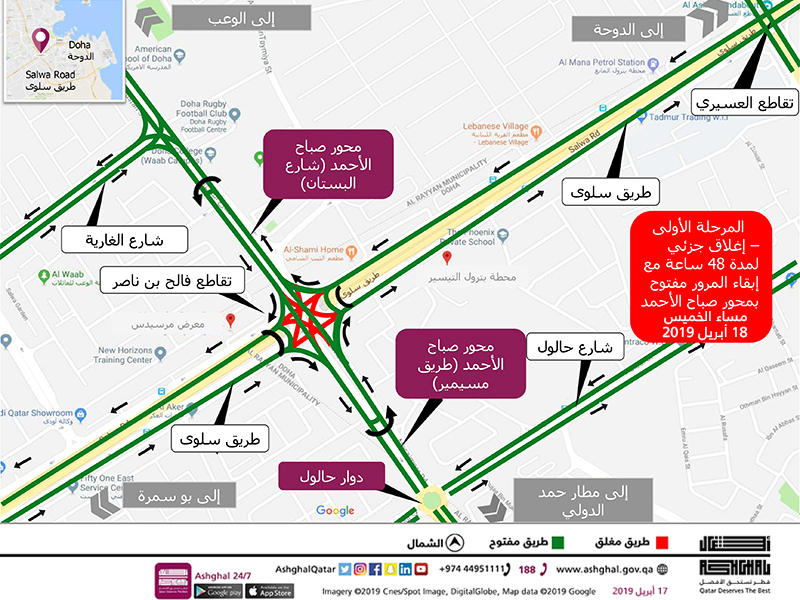 To facilitate the works, Ashghal announces a partial closure of Faleh Bin Nasser Intersection on Salwa Road, while maintaining traffic movement through Sabah Al Ahmad Corridor and right turns open, starting Thursday night of 18th April 2019 for 48 hours to enable construction works of the cable-stayed bridge on Sabah Al Ahmad Corridor. 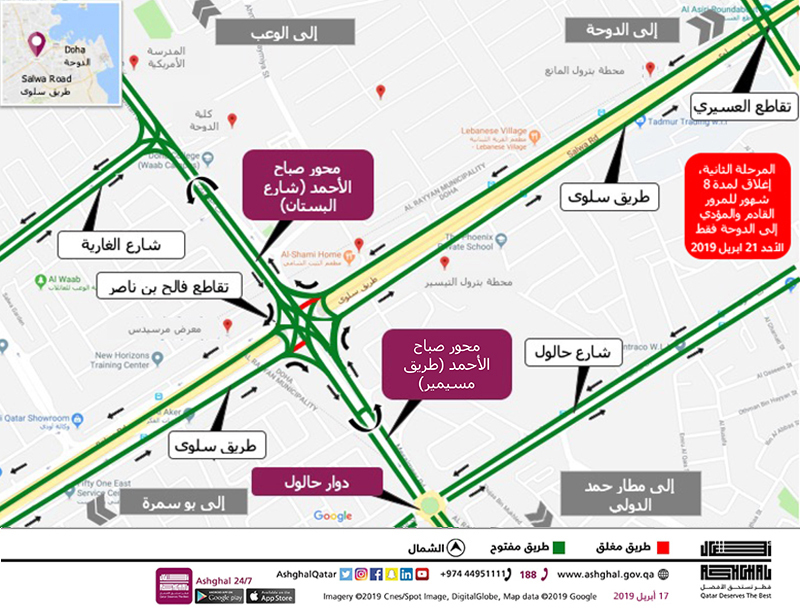 Road users heading and coming from Doha can take right turn at Faleh Bin Nasser Intersection then make a U-turn at around 250 meters then turn right to get back on Salwa Road. 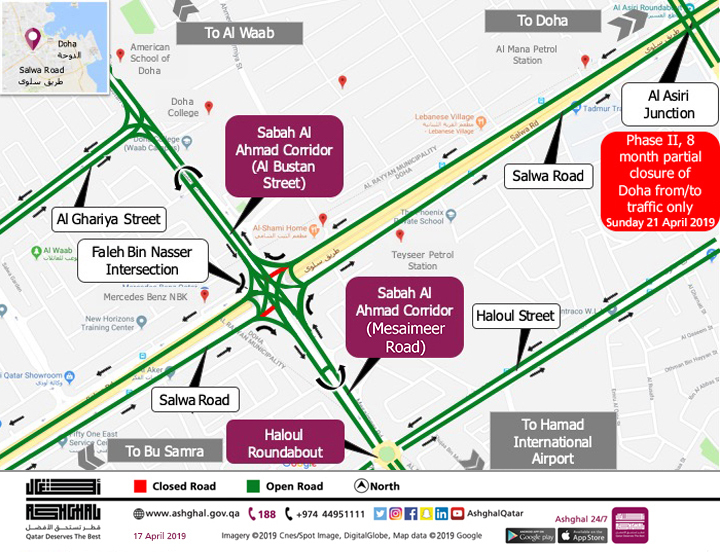 Road users coming from Mesaimeer Road towards Bu Samra and from Sabah Al Ahmad Corridor towards Doha will be required to continue straight through Faleh Bin Nasser Intersection for 250 meters then turn right to get back on Salwa Road. The Public Works Authority ‘Ashghal’ announces a partial closure of Faleh Bin Nasser Interchange at-grade for traffic on Salwa Road, starting Sunday morning 21 April 2019 for 8 months to enable construction works of the bridge on Sabah Al Ahmad Corridor. During this partial closure which is designed in coordination with the General Directorate of traffic, road users will be required to use alternative routes. 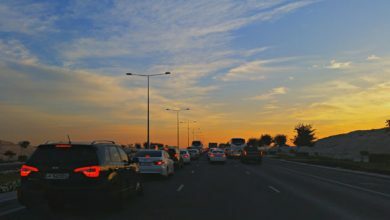 Traffic on Salwa Road heading and coming from Doha can take right turn at Faleh bin Nasser Interchange then do U-turn at around 250 meters then turn right to get back on Salwa Road. The Public works Authority will install road signs advising motorists of the traffic change. Ashghal requests all road users to abide by the speed limit and follow the road signs to ensure their safety. 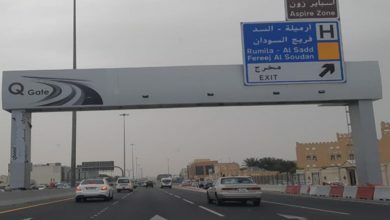 For its part, Ashghal has put up the new signage for Sabah Al Ahmad Corridor across areas, carrying a special writing rather than other roads. Ashghal has announced the completion on parts of Sabah Al Ahmad Corridor such as Al Watiyatt Interchange as well as Al Rayyan Tunnel, which is considered the longest, deepest bi-directional bridge in Qatar. His Excellency Sheikh Abdullah bin Nasser bin Khalifa Al Thani, Prime Minister and Minister of Interior and His Highness Sheikh Nasser Al Mohammad Al Ahmad Al Sabah, Representative of His Highness Sheikh Sabah Al Ahmad Al Jaber Al Sabah, Emir of Kuwait, had launched Sabah Al Ahmad Corridor project on 24 February 2019, in the presence of a number of ministers, members of Kuwaiti delegation,diplomatic representatives and senior officials as well as representatives from the project contractors were also present in the ceremony. Sabah Al Ahmad Corridor is the first in Qatar to be called the “Corridor” instead of a road due to its great importance and specifications of its unique construction, with the completion of the new Corridor in 2021 with a length of 25 kilometers and a total works of 37 kilometers, the road will have the first Cable-Stayed Bridge in Qatar as well as the largest intersection, longest bridge, deepest and longest bi-directional tunnel. The road will increase the importance of the Corridor that will include the upgrade of seven (7) main roads to become not only the “Doha traffic relief” by providing an alternative route to the busy 22 February street and a double traffic capacity, but also will link another traffic from the south of the country to the north via Doha By linking the Doha Expressway with the southern part of it (Al Wakra Bypass). 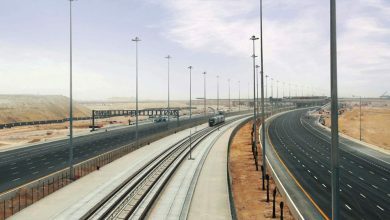 Sabah Al Ahmad Corridor extends for approximately 25 kilometres from Hamad International Airport to Umm Lekhba Interchange (known as Landmark Interchange) on Doha Expressway. Its scope includes the upgrade of seven (7) main roads namely, E Ring, F Ring, Mesaimeer, Al Bustan, Bu Erayyen, Lebday and sections of Al Markhiya Street. In addition, Ashghal will enhance 12 kilometres of local and peripheral roads intersecting with the Corridor. The total road works of the project is approximately 37 kilometres. 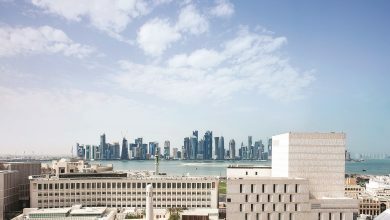 Once completed in 2021, Sabah Al Ahmad Corridor will significantly contribute to the relief of traffic congestion on Doha Expressway in particular, 22 February Street. The new Corridor will be a vital alternative and parallel route that will serve thousands of daily commuters from the north to the south of Doha. 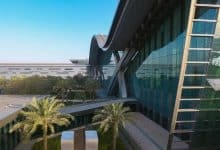 Commuters travelling from Hamad International Airport will be able to reach Umm Lekhba Intersection in approximately 18 minutes compared to the current 50 minutes via Doha Expressway and 22 February Street reducing traffic time by 70%. The new Corridor will also form a vital link between the north and the south through Al Doha. This interchange will also create a vital connection between Doha Expressway and Southern Part of Doha Express Highway (Al Wakra Bypass) as well as to Mesaieed Road through Al Watiyyat Interchange at F-Ring Road, which will constitute a key point to accommodate traffic to Doha Expressway and Sabah Al Ahmad Corridor. This significant improvement in traffic will be achieved by increasing the capacity of the road to 20,000 vehicles per hour in both directions, after the current expansion to four (4) and five (5) lanes in each direction rather than three (3) or two (2) lanes in each direction. While Doha Expressway currently accommodates 12,000 vehicles per hour in both direction. The project will convert all roundabouts to more efficient and safer signalised junctions as well as build and upgrade 17 interchanges. These interchanges will deliver 32 bridges and 12 vehicular underpasses to enhance connectivity and provide smooth traffic movements. 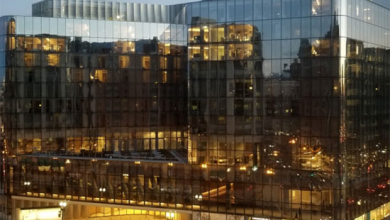 As part of the project’s scope of works is, a 12 pedestrian and cycle paths with a length 65 kilometres of along with 1.5 million square metre of landscaping. Sabah Al Ahmed Corridor includes the first Cable-Stayed Bridge in Qatar with a length of 1200 metres. It extends from Mesaimeer Road to Al Bustan Street and crosses over Halul Intersection on Mesaimeer Road and Faleh Bin Nasser Intersection on Salwa Road. 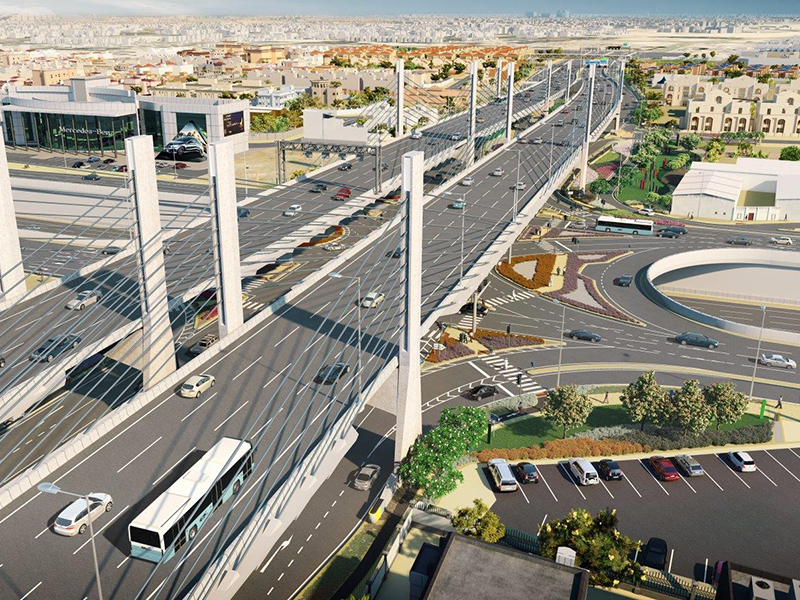 The Corridor will be the home to the longest flyover in the country, which spans 2.6 kilometres extending from Al Bustan Street to Bu Erayyen Street and crossing over Al Waab Street and Rasheeda Street. Sabah Al Ahmad Corridor will include the largest Interchange in Qatar. The impressively complex Umm Lekhba (Landmark) Interchange has nine (9) bridges providing a free traffic flow in all directions highlighting its significance as a key access point on Doha Expressway for local residential areas and malls. The project consists of the recently opened Al Rayyan Road, which is the longest and deepest bi-directional tunnel in Qatar. It sits 25 metres below ground level and extends for 2.1 kilometres connecting Bu Erayyen Street and Lebday Street. The new Corridor is a major link facilitating connections to 15 main roads namely Al Wakra Road, Ras Bu Abboud Road, E Ring Road, F Ring Road, Industrial Road, Salwa Road, Al Rayyan Road, Al Waab Street, Al Luqta Street, Al Markhiya Street, Doha Highway and Khalifa Avenue. It will serve 25 densely populated residential areas such as Al-Thumama, Al Nuaija, Bu Hamour, Al Waab, Al Rayyan, Al Luqta, Al Gharrafa, etc. Sabah Al Ahmad Corridor will facilitate access to most of the World Cup FIFA 2022 stadiums including Ras Bu Abboud, Al Thumama, Al Wakra, Khalifa International and Qatar Foundation Stadiums. The Corridor provides easy access to some of Doha Metro stations such as the Economic Zone, Al Waab and Old Rayyan. بدأت هيئة الأشغال العامة “أشغال” تنفيذ أعمال إنشاء أول جسر معلق في قطر وتطوير دوار حالول إلى تقاطع من مستويين ضمن مشروع محور صباح الأحمد. 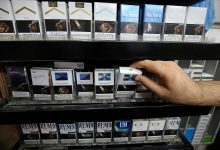 يمتد الجسر الجديد بطول 1200 متراً من قبل دوار حالول مرورا بتقاطع فالح بن ناصر بطريق سلوى ليوفر حركة مرورية حرة بين مطار حمد الدولي ومناطق بوهامور ومسيمير والوعب ، خصوصا وأن الجسر الجديد سيتألف من أربعة مسارات في كل اتجاه لتستوعب نحو أكثر من 16000 مركبة في الساعة في الاتجاهين. ونظرا لطول الجسر ستتطلب أعمال البناء استخدام854 قطعة خرسانية سابقة الصب ليصل وزن الواحدة منها نحو 200 طن وإقامة 20 عموداً و16 دعامة ليصل ارتفاع أعلى نقطة من الجسر إلى 30 متر. سيتم تحويل دوار حالول إلى تقاطع من مستويين، حيث سيتضمن تقاطع بإشارات ضوئية على سطح الأرض ليمر من فوقه الجسر المعلق ذو التدفق المروري الحر. 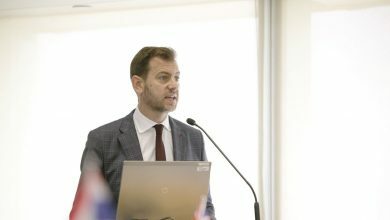 ومع انتهاء أعمال الإشارات الضوئية سيتألف التقاطع من خمس مسارات في كل اتجاه، وسيعمل التقاطع على توزيع الحركة المرورية في كافة الاتجاهات ليربط محور صباح الأحمد بشارع حالول وطريق سلوى ويخدم بوهامور والمعمورة والعديد من المرافق الحيوية المحيطة مثل السوق المركزي والأنشطة التجارية على طريق سلوى. من جانبه، أكد المهندس عبدالله النعيمي أن “أشغال” بدأت فعليا في تشييد أول جسر معلق في قطر والذي تم تصميمه بطريقة فريدة لتوفر حركة مرورية حرة دون الحاجة للمرور من دوارات أو إشارات ضوئية خصوصا وأن الجسر سيمر من فوق تقاطع حالول وكذلك فوق تقاطع فالح بن ناصر بطريق سلوى، وهو أمر سيخفف الازدحام في المنطقة الحيوية بشكل كبير. ولإتاحة المجال أمام تنفيذ أعمال الجسر المعلق وتقاطع حالول ستقوم “أشغال” بإغلاق جزئي لإشارات تقاطع فالح بن ناصر على طريق سلوى على مرحلتين اعتباراً من مساء يوم الخميس 18 إبريل 2019 ولمدة 8 شهور، وذلك بالتنسيق مع الإدارة العامة للمرور. 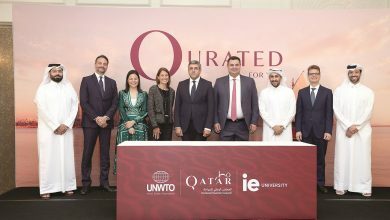 ستقوم “أشغال” بإغلاق مؤقت للحركة المرورية على الإشارات الضوئية بتقاطع فالح بن ناصر مع إبقاء حركة المرور مفتوحة على محور صباح الأحمد بالإضافة إلى الانعطافات اليمنى اعتباراً من مساء يوم الخميس 18 إبريل 2019 لمدة 48 ساعة بهدف تنفيذ أعمال الجسر المعلق ضمن مشروع محور صباح الأحمد. وكما هو مبين بالخريطة المرفقة، يستطيع رواد طريق سلوى المتجهون من وإلى الدوحة الانعطاف يميناً عند إشارة تقاطع فالح بن ناصر والمواصلة لمسافة 250 متر ثم الدوران إلى الخلف والانعطاف يميناً وصولاً إلى طريق سلوى، وللمتجهين من محور صباح الأحمد إلى بوسمرة والدوحة سيتوجب عليهم مواصلة سيرهم لمسافة 250 متر عبر تقاطع فالح بن ناصر ثم الدوران إلى الخلف والانعطاف يميناً وصولاً إلى طريق سلوى. ستقوم “أشغال” بتنفيذ إغلاق جزئي لإشارة تقاطع فالح بن ناصر أمام حركة المرور على طريق سلوى صباح يوم الأحد 21 ابريل 2019 لمدة 8 شهور. وكما هو مبين بالخريطة المرفقة، يستطيع رواد طريق سلوى القادمون من وإلى الدوحة الانعطاف يميناً عند إشارة تقاطع فالح بن ناصر والمواصلة لمسافة 250 متر ثم الدروان إلى الخلف والانعطاف يميناً وصولاً إلى طريق سلوى. 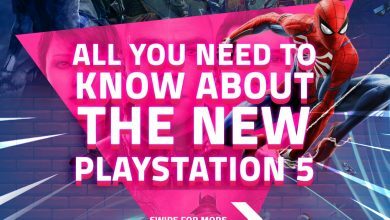 ستقوم هيئة الأشغال العامة بتركيب اللوحات الإرشادية لتنبيه مستخدمي الطريق بهذا التغيير المروري، وتهيب بجميع مستخدمي الطريق الالتزام بحدود السرعة المسوحة واتباع اللوحات الإرشادية حفاظاً على سلامتهم. 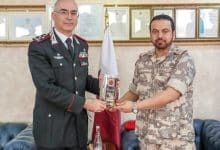 قامت “أشغال” بوضح العديد من اللوحات الإرشادية التي تحمل اسم محور صباح الأحمد في مختلف انحاء البلاد، وقد تم كتابة اسم الطريق برسم مميز يختلف عن باقي الطرق. وكان معالي الشيخ عبدالله بن ناصر بن خليفة آل ثاني، رئيس مجلس الوزراء ووزير الداخلية و سمو الشيخ ناصر المحمد الأحمد الصباح، ممثل حضرة صاحب السمو الشيخ صباح الأحمد الجابر الصباح، أمير دولة الكويت، قد دشنا مشروع محور صباح الأحمد 24 فبراير 2019، بحضور عدد من أصحاب السعادة الوزراء ووفد من دولة الكويت وأعضاء السلك الدبلوماسي المعتمدين لدى الدولة ورؤساء الهيئات وكبار المسئولين وممثلين عن الشركات المنفذة. ويعتبر محور صباح الأحمد هو أول طريق في قطر يطلق عليه اسم “محور” بدلا من طريق نظرا لأهميتة الكبيرة ومواصفات بنائه الفريدة، فمع اكتمال المحور الجديد في 2021 وبطول 25 كيلومتر وبإجمالي أعمال 37 كيلومتر سيمتلك الطريق أول جسر معلق في قطر وكذلك أكبر تقاطعا وأطول جسرا وأعمق وأطول نفقاً ثنائي الاتجاه. ويزيد من أهمية الطريق أن المحور أنه سيتضمن تطوير نحو 7 طرق رئيسية ليصبح ليس فقط بمثابة “رئة الدوحة” من خلال توفير طريق بديل لشارع 22 فبراير المزدحم وبسعة مرورية مضاعفة لكنه أيضا سيضحي حلقة وصل أخرى للحركة المرورية القادمة من جنوب البلاد إلى الشمال عبر مدينة الدوحة من خلال ربط طريق الدوحة السريع مع الجزء الجنوبي منه (الوكرة الموازي). ويمتد مشروع محور صباح الأحمد من مطار حمد الدولي حتى تقاطع أم لخبا، المعروف بـ (تقاطع اللاندمارك) بطريق الدوحة السريع لمسافة تتجاوز 25 كيلومتر، حيث يتضمن تطوير سبعة طرق رئيسية وهي الطريق الدائري الخامس والطريق الدائري السادس وطريق مسيمير وشارع البستان وشارع بو اعرين وشارع البديع وأجزاء من شارع المرخية، هذا إلى جانب تطوير العديد من الطرق الجانبية والمتعامدة مع محورصباح الأحمد بطول نحو 12 كيلومتر، ليصل إجمالي أعمال المشروع لنحو 37 كيلومتر. 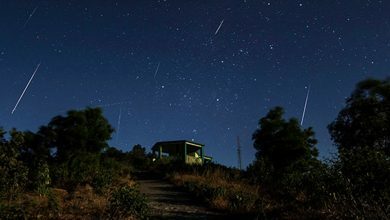 يعد محور صباح الأحمد بمثابة “رئة الدوحة” والذي سيساهم بشكل كبير عند اكتماله في نهاية 2021 على الحد من الاختناق المروري الذي يشهده طريق الدوحة السريع خصوصا شارع 22 فبراير حيث أن الطريق الجديد يعتبر شرياناً حيوياً، وسيوفر طريقاً بديلاً وموازياً يخدم الآلاف من مرتادي الطريق يومياً بين جنوب الدوحة وشمالها. وسيتمكن القادم من مطار حمد الدولي عبر المحور الجديد من الوصول إلى تقاطع أم لخبا في نحو 18 دقيقة فقط في الوقت الذي تستغرق الرحلة نفسها عبر طريق الدوحة السريع وشارع 22 فبراير نحو 50 دقيقة، وهو ما يعني توفير نحو 70% من زمن التنقل. 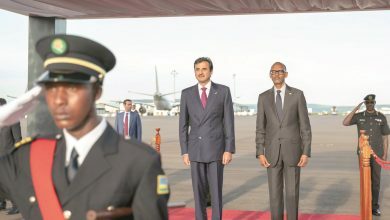 كما يعتبر الطريق الجديد حلقة وصل رئيسية أمام القادمين من جنوب قطر إلى شمالها عبر مدينة الدوحة حيث سيعمل على تكامل طريق الدوحة السريع مع الجزء الجنوبي منه (الوكرة الموازي) والواصل لطريق مسيعيد من خلال تقاطع الوطيات بالدائري السادس حيث يعتبر نقطة توزيع إلى طريق الدوحة السريع من جهة وإلى محور صباح الأحمد من جهة أخرى. 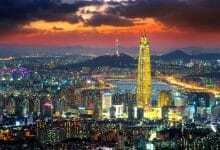 هذا التحسن الكبير في الحركة المرورية سيحدث بفضل زيادة الطاقة الاستيعابية للطريق إلى أكثر من 20,000 ألف مركبة في الساعة في الاتجاهين بعد توسعة الطريق القائم حالياً إلى أربعة وخمسة مسارات في كل اتجاه بدلاً من اثنين وثلاثة مسارات في حين يستوعب طريق الدوحة السريع حالياً فقط نحو 12,000 ألف مركبة في الساعة في الاتجاهين. 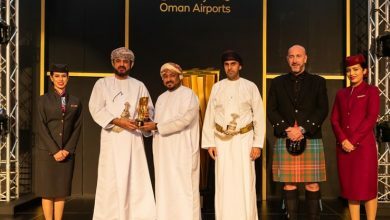 هذا وقد تم التخطيط إلى تحويل الدوارات القائمة إلى تقاطعات بإشارات ضوئية وتوسعة التقاطعات القائمة وإنشاء وتطوير نحو 17 تقاطعاً تسهل الوصول من وإلى الطريق من جميع الاتجاهات والتي تتضمن 32 جسراً من أربعة مسارات في كل اتجاه و12 نفقاً للسيارات لتوفير حركة مرورية حرة. كما سيتضمن المشروع إنشاء 12 جسراً للمشاه ومسارات للدراجات الهوائية والمشاة بطول 65 كيلومتر، بالإضافة إلى تجميل وتشجير مساحة تقدر بـ 1.5 مليون متر مربع. يتضمن مشروع محور صباح الأحمد أول جسر معلق من نوعه في قطر بطول 1200 متراً يمتد من طريق مسيمير وصولاً لشارع البستان ليعبر فوق كل من تقاطع حالول بطريق مسيمير وتقاطع فالح بن ناصر بطريق سلوى. يتضمن المشروع أطول جسر في البلاد بطول 2.6 كم يمتد من شارع البستان لشارع بو اعرين ليعبر فوق شارع الوعب وشارع رشيدة. 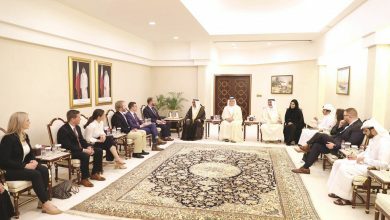 يتضمن محور صباح الأحمد أكبر تقاطع في قطر ألا وهو تقاطع أم لخبا حيث يحتوي على تسعة جسور توفر تدفقاً مرورياً حراً في كافة الاتجاهات، وتزداد أهميته كونه حلقة وصل على طريق الدوحة السريع المزدحم والذي يحيطه مناطق سكنية ومراكز تجارية هامة. يتضمن مشروع المحور نفق الريان والذي تم افتتاحه مؤخراً حيث يعتبر أطول وأعمق نفق ثنائي الاتجاه في قطر بطول 2.1 كلم ليمتد بين شارع بو اعرين وشارع البديع وعلى عمق 25 متراً. المحور الجديد هو حلقة وصل رئيسية تربط نحو 15 طريق رئيسي مثل طريق الوكرة وشارع راس بوعبود والطريق الدائري الخامس والطريق الدائري السابع وطريق المنطقة الصناعية وطريق سلوى وطريق الريان وشارع الوعب وشارع اللقطة وصولاً لشارع المرخية وطريق الدوحة السريع من جهة وطريق خليفة أفنيو من جهة أخرى، وهو ما يخدم أكثر من 25 منطقة سكنية ذات كثافة سكانية عالية مثل الثمامة ونعيجة وبوهامور والوعب والريان واللقطة والغرافة وغيرها. يسهل محور صباح الأحمد الوصول إلى معظم ملاعب بطولة كأس العالم لكرة القدم 2022 مثل استاد راس بوعبود واستاد الثمامة واستاد الوكرة واستاد خليفة الدولي واستاد المدينة التعليمية. يتكامل مشروع المحور مع شبكة المترو عن طريق الربط بين عدة محطات مثل محطة المنطقة الاقتصادية ومحطة الوعب ومحطة الريان القديم.